Naruto 628 gets back to the usual action of a push and tug war between Naruto and the others against Obito and Madara. We start with Obito keeping on the ball trying top Naruto’s actions but Naruto keeps on mentioning that his love is stronger than anything. Obito takes Kakashi using his Kamui to fight on a different universe when Madara detects that his rival Hashirama has also been reanimated! 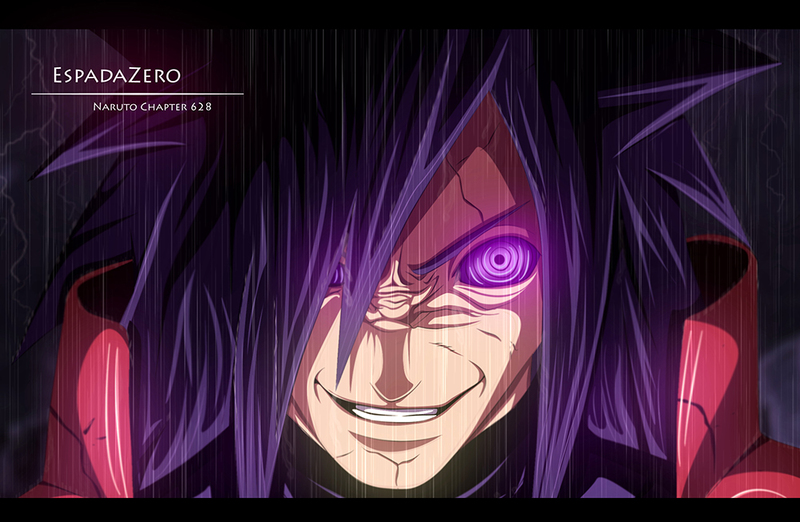 Naruto 628 as both Madara and Obito as well as the Ten Tails attacking, with the Uchiha’s using their Fire Element. 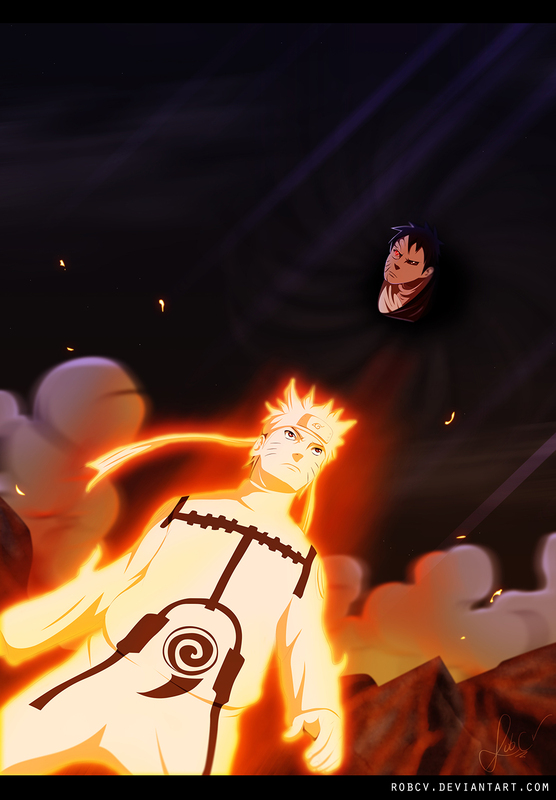 Naruto looks on the fire seems to have gone through a number of people, however Naruto was able to increase their cloak powers to help them not get injured. 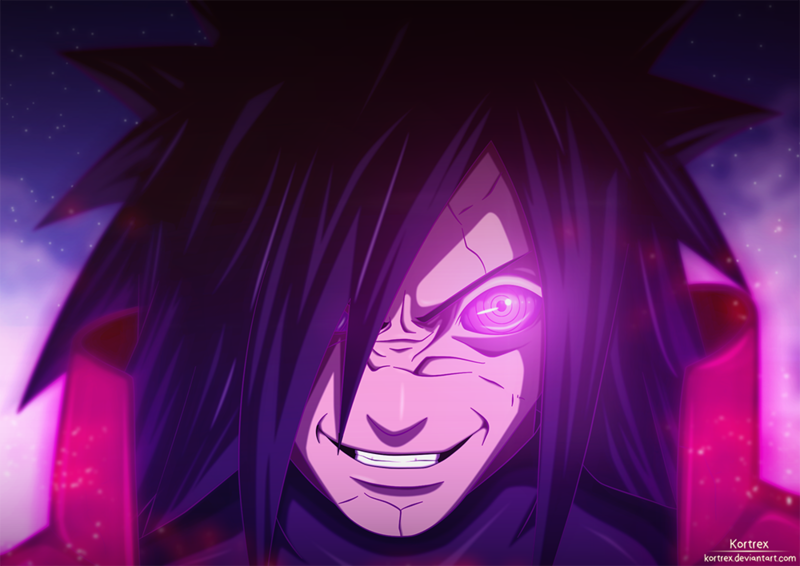 Madara uses his Susanoo and Obito his technique to summon a number of kunai’s. 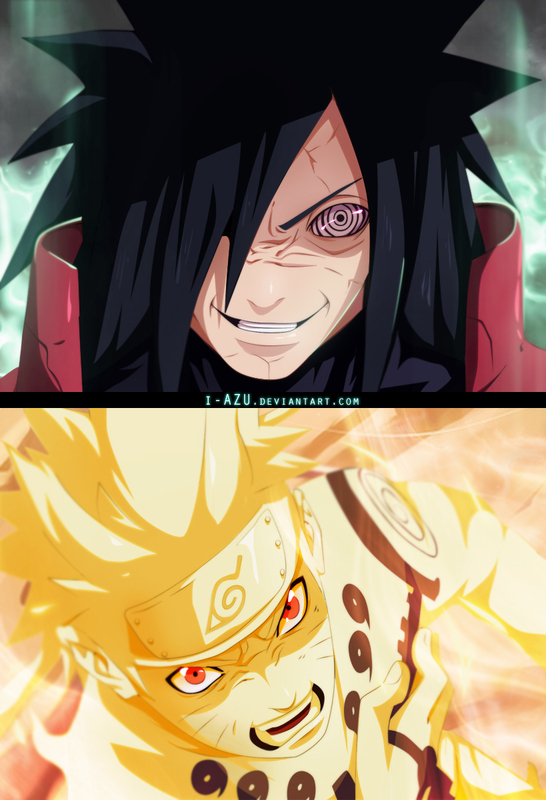 Madara launches his beads, Choji realizes that if it wasn’t for Naruto, they would have all died. Naruto concentrates and uses the tails on the cloaks to help push the kunai’s away from them. Sakura realizes that Naruto has been protecting all of them non stop, she asks how they’re going to keep this up as he’s currently tired, Kakashi tells Naruto that Obito’s above him, Naruto moves away from that spot. Obito asks that he’s been covering everyone else’s asses, is there a reason to what he’s currently doing. Kurama steps in asking Naruto how he’s doing, how can he even micromanage all the chakra that he’s given to others. Plus he tells him that the Ten Tails seems to be accumulating a lot of chakra. Obito tells him that he’s exhausting himself for no reason. Naruto then reveals that he wouldn’t expect a loner like him to understand. He tells Obito that he’s currently on could nine, when he’s comrades are near him, that is what fuels and empowers him. Naruto tries to attack but Obito escapes in time. If he feels his comrades pain and death, will it bring them closer and see it as another connection he adds. Why bother protecting them to this extent he asks. Naruto calls what Obito’s saying diarrhea of the mouth of yours making him nauseous, it makes him think that he’s nothing more than a selfish prick. He tells him to keep on talking because what ever happens, any feelings he gets will be forever with him, he locks them down and thus never wants to let go. He may be a little self, but having no comrades around at all makes his heart ache so much that he can’t put it into words! Kakashi wonders if Obito’s not just trying to make Naruto his guinea pig is he. Madara standing on the rock realizes that he’s sensed someones chakra. He knows that this chakra belongs to Hashirama! He has such a grin on his face! The Ten Tail gains more power to which he makes his hands bigger, every notices that Naruto’s chakra is interfering with their main jutsu, Kurama mentions that what is happening is bad, it’s currently going for the Heaven and Earth Paranormality, Naruto asks what it is. 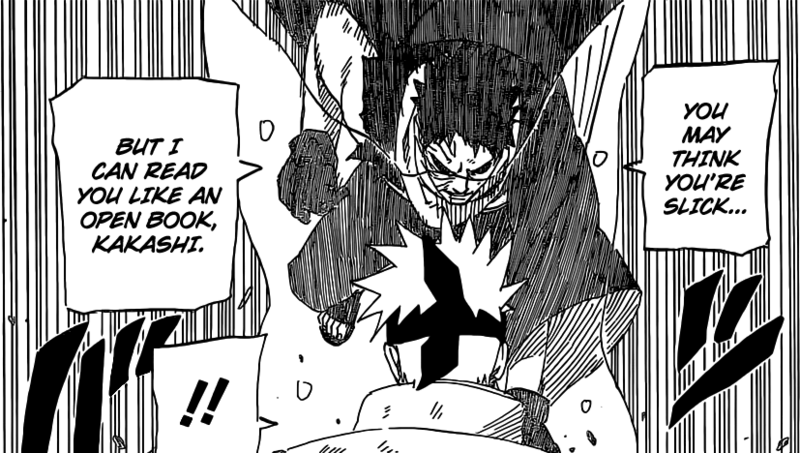 Outside, Obito mentions that this is going to happen after he was cut off, the only way to suppress it is to become it’s Jinchuuriki. Cracks and many other things start to appear, the weather changes tremendously, Madara mentions for the fun to begin, Kakashi mentions that he’s going to erase the Ten Tails with his Kamui, however out of nowhere Obito pops out telling him that he’s an open book, quickly Obito and Kakashi get into a different dimension, telling Naruto to take care of things. The weather gets even worse with storms and thunder everywhere. Naruto 628 ends here. A fantastic chapter featuring a lot of exciting and we finally know that from that Kakashi and Obito are finally going to go on a head to head battle against each other! It’s going to be amazing them go rip each others head out. And possibly getting an explanation to why Kakashi killed Rin, also Madara’s detected Hashirama, so it’s going to take a few chapters to see them in current ones. 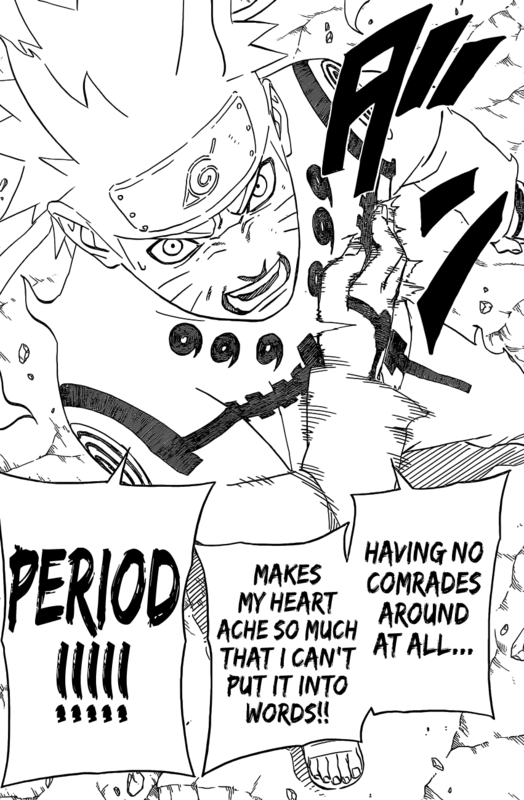 Can’t wait for next week’s Naruto 629, when we finally see a lot more action during this war. Alright, we’re finally back to the battle! I don’t think it will be that long until the hokages show up because even though it took around 2 months for them to tell Sasuke the truth, it was probably only a matter of minutes in real time.l So, since he just sensed their energy in this chapter, I’m guessing that they’re just starting to tell Sasuke about the truth. Once that’s done with, thanks to Minato’s great speed, they’ll be at the village in no time. I can’t wait til those fights start up! I don’t think Kakashi taking away Obito was a good move on his part. 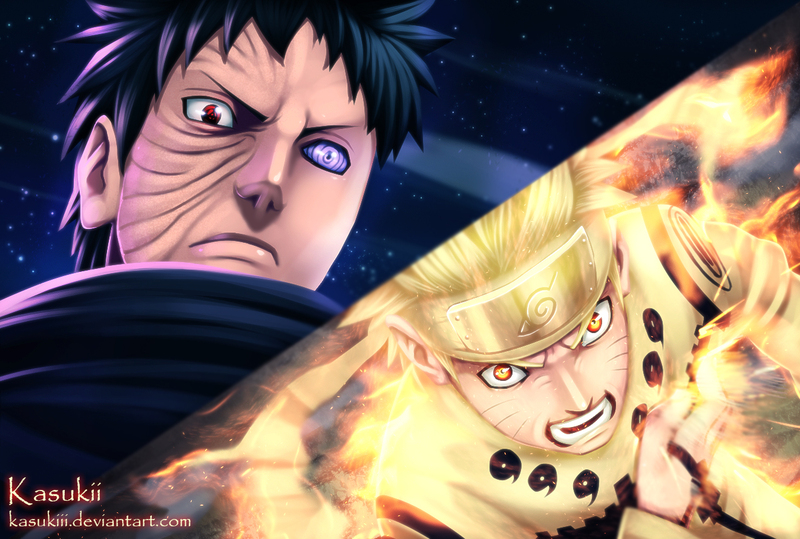 Obito can destroy him and go back to the battle, or just warp out on his own. I guess they can finally hash out their personal issues though. I’ll be eagerly awaiting the next chapter! Don’t forget Kakashi also got some of Narutos chakra and he may just be one of the few that’ll put it to good use.